Late last year I noticed a new book on skinny quilts. I was immediately drawn to the quilt, but in looking at it, I determined it was something that I could do. Showing up at my weekly Friday sewing group 3 of the other 4 members saw the same book and were also drawn to the quilt. Fast forward to January when the designer of the quilt visits our quilt guild and has a workshop to create the quilt from the book. I didn’t really feel I needed the class, but I knew that if I signed up, I would actually get the quilt made. That turned out to be true. 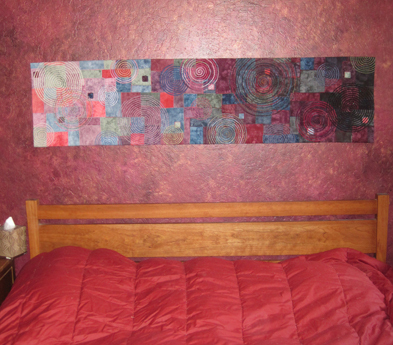 This quilt required lots of different pieces of fabric. I used 4 colors and I dyed 4 shades of each color and 6 values (light to dark) of each color so that made 24 pieces of fabric for each of my 4 colors for a grand total of 96 pieces. Thankfully I only needed a small amount of each fabric. I ended up using fat 16th’s (9×10 inches). That said, the quilt probably only uses only 40 of those pieces of fabric. This project also got me to dry dyeing yarn. I’ve always wanted to try it, but have never gotten around to it. It was a lot of fun and it turned out much better than I could have hoped for in a first try. Now that it is temporarily hung in the bedroom I think it needs to be a triptych. I don’t like the light just at one end. I think I will make a second one and cut it in half and hang one above and one below with the light on the opposite end. That way I visually get light at both ends. Hopefully it won’t take me another 3 months to make that happen and see if it matches the vision in my head.